Standing cup; silver-gilt; chased; form of bear seated on hind quarters and grasping staff with right paw; removable cast head with buckled collar with quatrefoils in relief; oval base with gadrooned edge; inscribed. Origin: Uncertain; previously attributed to the Augsburg workshop of Marx Weinold (master c. 1665, died 1700) on the evidence of the marks stamped on the neck; in part no older than 19th century. (i) Assay mark for Augsburg 1685-1700 (probably R3 186) or Seling 156 (1698). (ii) The initials MW within an oval: the punch of Marx Weinold (R3 726; Seling 1671). Commentary: The maker's mark had been tentatively associated in Rosenberg I (1922) with Mattheus or Markus Wolff of Augsburg (died 1716), but in Seling 1980 it is identified as the punch-mark of Marx Weinold, the Augsburg goldsmith who married three times (1665, 1680 and 1691) and died in 1700. Both Rosenberg and Seling have accepted this bear and ragged staff cup as part of this maker's oeuvre and have incorporated it within their short list of extant works by this Augsburg goldsmith. Among his well-documented works are two pieces in the Moscow Kremlin and the Hahn der Blarer von Wartensee in the Schweizerisches Landesmuseum, Zurich (see ‘Weltliches Silver’, 1977, p. 178, no. 261). This bear cup may also be compared with Marx Weinold's 1690 three smiths cup in the Waddesdon Bequest (WB.127); the latter is a very different type of object, but the quality of workmanship seems far superior. In Read 1902 it was recognised that the bear's head, which is very heavy and thick, had been cast, but there was no suggestion that the rest of the bear might also be cast. Apart from the very visible mould seam inside the thick, heavy head there is also a seam running horizontally around the inside of the middle of the bear's body, which is equally clear when the interior is closely examined. The four limbs of the bear are also made separately and attached to the flat exterior surface of the bear's body; there are no openings in the body at the points where the four limbs join it, and there is every indication that they were separately cast and added, leaving only a little hole at the least conspicuous part of the join. Even the short tail of the bear seems to be cast and added in the same way. The two hind legs each have a small casting (?) hole at the rear (on each heel); the two holes serve no purpose and, as they are not threaded, it is difficult to postulate an alternative function for them, even if the bear had previously been mounted on a different base. Furthermore, the two screws attached to the underside of the flat feet seem to be original. The oval, gadrooned base does not appear large enough for the bear and, oddly, it is not marked. Furthermore, it may not have been originally intended for this figure because the decoration, which is largely hidden by the bear, is arranged horizontally, like a landscape picture - not arranged around the bear's hind quarters, as seen from above. The neck-flange bearing the punch-marks is also a separate strip of silver which has been joined to the body and, on the inside, the sharp lower edges of the strip can be felt projecting all the way round. Even if the marks on this strip are genuine, the strip might have been cut from an authentic (but unimportant) piece of silver plate by Marx Weinold. The bear was a popular south German form for a cup of this kind and a number have survived, including the well-known and very amusing late sixteenth-century bejewelled example (H. 20.8 cm) by Gregor Bair (Kunsthistorisches Museum, Vienna, inv. no. 1094), which depicts the bear as a hunter, standing and taking aim with the gun that it holds in its raised paws. Perhaps the most comparable example, however, is the Augsburg silver-gilt bear (H. 18.3 cm) by Leonhard Umbach, c. 1600, which is preserved among the Württemberg treasures in Stuttgart (see J. F. Hayward, ‘Virtuoso Goldsmiths and the Triumphs of Mannerism 1540-1620’, Sotheby Parke Bernet Publications, London, 1976, p. 386, pl. 504; also Seling 1980, p. 250, fig. 155). 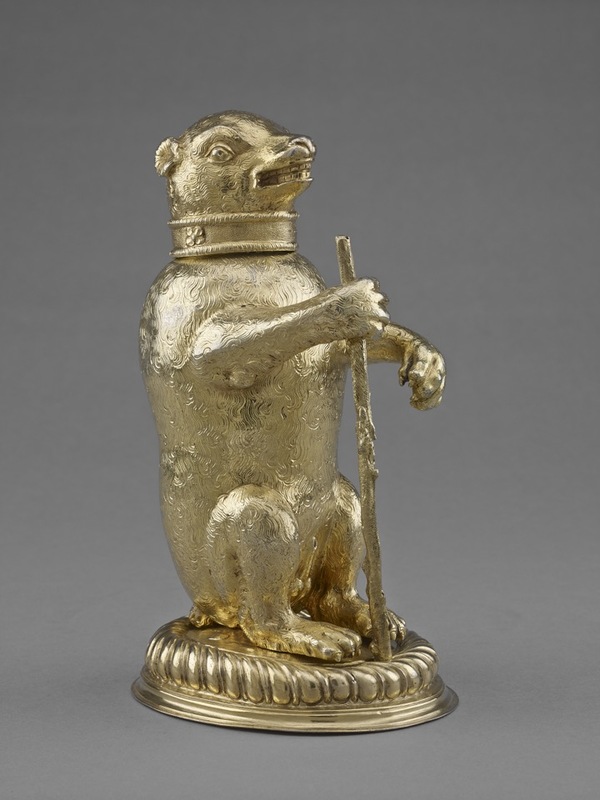 The bear, with a chain round its middle, is represented squatting on its hind quarters in exactly the same way, except that it has no base and its front paws are only executed in high relief- not made separately and joined on, as in the Waddesdon Bequest example. Furthermore, the Stuttgart bear has a more finely modelled head with a longer snout and the jaws are a little open in a naturalistic fashion; even the narrow collar fits the neck of the bear in a more realistic and convincing manner. Two bear cups by Leonhard Umbach of Augsburg were lent to the ‘Welt im Umbruch’ exhibition (‘Welt im Umbruch: Augsburg zwischen Renaissance und Barock’ II Rathaus, Augsburg, 1980, nos 759-60); again they are depicted holding a firearm in their paws. Two more small silver-gilt bears (H. 12. I cm) attributed to Leonhard Umbach, c. 1600, were in the Lamon Collection (Christie's Sale Catalogue, 28 November 1973, lot 60, with illus.). Both are squatting on their hind quarters and holding in their paws bagpipes; the detachable heads are chained to the waists, around which a chain is engraved. It is suggested in the Sale Catalogue that these two examples may be the ones listed in two different collections in Rosenberg I, 1922, R3 399 (i) and (k), and that more recently they were united in the Lamon Collection to form a pair. As they duplicate each other in every detail, it is unlikely that they were intended as a pair; the existence of at least one other example (in the von Nemes Collection, Munich auction sale, 1931) suggests that these little bears with bagpipes may have been cast in some quantity. Perhaps the secondary feature that adds most to the doubts about the present state of the Waddesdon Bequest bear cup is the detachable ragged staff that slots through the bear's right paws and, at the lower end (with its projecting screw-thread), is designed to pass through the hole in the base and be fastened by a nut. It is made in a crude and atypical manner, with few of the realistic details on the surface that a work by Marx Weinold might be expected to exhibit. Like the head of the bear, the ragged staff could be dismissed as a later replacement, but was there a ragged staff with Weinold's bear originally? In Renaissance England, the device of the bear and ragged staff had a special meaning because it was the personal badge of Queen Elizabeth I’s favourite, Robert Dudley, Earl of Leicester (died 1588). During the first two decades of Elizabeth's reign he was a dominant figure at Court and many of his extravagant jewelled gifts to her incorporated his badge of the bear and ragged staff. Although there can be no connection between Robert Dudley and the Augsburg goldsmith Marx Weinold who died more than one hundred years later, it is not impossible that this cup might have been made more interesting for an English collector who was aware of the significance of the bear and ragged staff. There is little reliable evidence to support Timothy Schroder's suggestion that, towards the end of the seventeenth century, there was a modest revival of the great Renaissance fashion for silver cups in the form of animals (see T. B. Schroder, ‘The Art of the European Goldsmith: Silver from the Schroder Collection’, New York, 1983, p. 156, no. 61, where the rearing bull cup by Marx Weinold “ca. 1700” is also made in the same way with the seam around the middle of the body being clearly visible, even on the exterior surface, and where the body is described as “cast in seven sections”). Fortunately, the punch-marks on the Schroder Collection bull are also reproduced (p. 203); the maker's mark appears to correspond with the mark on this bear cup. If any of these animal cups are truly by Marx Weinold, then they reveal this Augsburg maker to be not only a dull copyist of Renaissance prototypes but also a technically inferior craftsman. In fact, such a conclusion is dramatically disproved by the brilliance of the parcel-gilt Minerva dish, which had probably been presented by the Swedish King Charles XII to Peter the Great in 1699; it was lent in 1986 by the Hermitage Museum in Leningrad to an exhibition held at the Villa Favorita, Lugano, Switzerland (see ‘Ori e Argenti dall’ Ermitage’, (‘Gold and Silver Treasures from the Hermitage’), Collection Thyssen-Bornemisza, Lugano, 1986, no. 26, with col. pl. on p. 63). Until further evidence comes to light, the origin of this bear and ragged staff cup in the Waddesdon Bequest remains in doubt. Hugh Tait, 'Catalogue of the Waddesdon Bequest in the British Museum, II : The Silver Plate', British Museum, London, 1988, no. 55, figs. 310-313.